The scene was like something out of a music video- red low lights filled the Hammerstein Ballroom, clouds of vapor via a smoke machine and celebrity sightings galore… and that was inside the venue; outside of the venue, in order to get inside we had to push through a mob of thousands of people! Philip Plein is a European export, who has shown his men’s and women’s fashion collections twice in New York so far, of which he says “…each time I show it gets better and better, and this collection is the best yet, and I apologize for the chaos getting in here tonight,” in direct response to the mob scene outside of the venue. After Plein’s introduction to the show, the venue came to life… with less of a fashion show but more of a concert; with Future performing the soundtrack! Future rolled out his big hits, “Mask Off,” “March Madness” and “F*ck Up Some Commas,” as the models strutted down the runway. 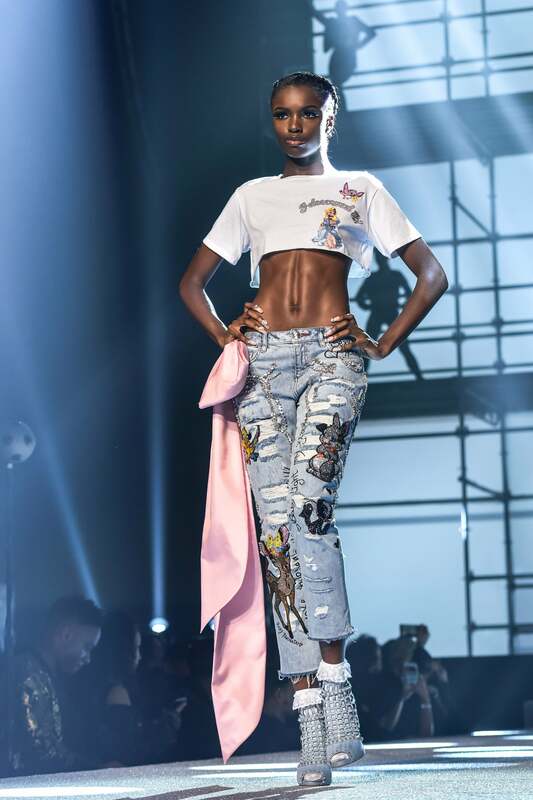 Big-name industry models such as Golden Barbie (Jasmin Sanders), shared the catwalk with music industry elite such as Rae Sremmurd, 21 Savage, Snoop Dogg’s son Cordell Broadus and father, Vernell Varnado. Teyana Taylor (fresh off of her VMA win for Kanye’s “Fade” video), appropriately ended the fashion show with a risqué but entertaining dance sequence on the catwalk, where she literally dropped it like it was hot!! The front-row was also lit! 50 Cent, Iman Shumpert, Ne-Yo, Christian Combs, Fifth Harmony, Marlo Hampton, Paris Hilton, Lil’ Kim and many more filled the room. It’s safe to say we all walked away satisfied.